Pegasus Boxis a professional Samsung cell phone service device. It can unlock Samsung phones, read and write firmware, reset/read codes. With Pegasus you can easily restore IMEI; fix serial number, repair dead phones, repair software problems (blinking phone, no signal, phone restricted etc.). Pegasus can work with 256 phones simultaneously. Multitasking. Pegasus works with 256 phones at the same time. 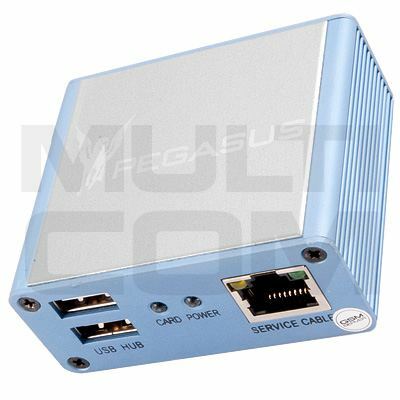 Work with any communication interface that creates a virtual COM port or UFS-like devices. Models are sorted in alphabetic order. Easy smart-card activation and further automatic updates without additional reg-files or activation strings. Windows XP, Windows Vista and Windows 7 compatibility. Additional modules activation without any hardware changes or additional equipment. Platform independent single-file firmware system. Correct File System flashing for all phones and platforms. Correct work with Dual SIM-cards phones. Access to Boot-Loader v2.0 - the richest firmware repository.